Chutes, Ladders, and an Unbelievable Story! 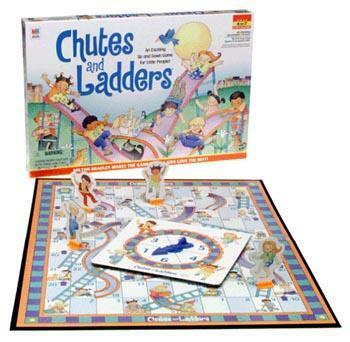 Chutes and Ladders has been a staple of the American childhood experience since 1943. Originally created in ancient India as Moksha Patam or Snakes and Ladders (the original name and translation), it was associated with traditional Hindu philosophy contrasting karma and kama, or destiny and desire. According to Wikipedia: "The game (Snakes and Ladders) was designed to emphasize randomness and destiny, whereas other games require a mixture of skill and free will." Like every other part of our lives, much of what we do each and every day has an element of skill associated with it and comes with some modicum of control. But as in Chutes and Ladders, some things are left entirely up to chance where we are powerless. We (the Be Part of the Music team and I) recently experienced a significant “chute-like” event. Approximately a year ago, one of our existing sponsors made a significant offer to become the sole presenting sponsor of Be Part of the Music. This sponsorship allowed us to fully realize our long held vision while providing us with the long-term security that would allow us to hire employees and tackle bigger projects. Ladder! Eight weeks ago the SEC (Securities & Exchange Commission) and the FBI raided the offices of the investor/owner for allegedly running a large scale and long play Ponzi scheme. The assets of his seven (non-music related) businesses were seized and all 79 innocent and hard working employees were immediately furloughed without pay. All contracts were declared null and void and all business relationships were severed. Chute! Chaos ensued as the authorities seized everything and a court appointed conservator took control of all assets. This shock of it all and the subsequent fall out have been significant, both on a personal and professional level. The worst part is that Be Part of the Music is in peril as the actions of one person have jeopardized six years of work as we have been operating without funding since last September. To be clear, as bad as our situation is, it does not compare to the hundreds of investors who lost their life's savings or the eighty families who were sent looking for work during the holiday season. They are the real victims. We are collateral damage. What will happen with Be Part of the Music? In short, we don't know, but we are trying to figure it out. For the past eight weeks we’ve been taking every meeting, exploring every option, and considering all possible avenues. In the meantime, thanks to the generosity and no quit attitude of our team, we’re at least going to finish what we started. And we have started a lot. In the coming days we are going to release a significant new offering that has been in the works for quite some time. It could be a game changer for thousands and thousands of music educators. Our plan (if possible) is to follow that up with ANOTHER new and equally significant program announcement in April or May. For the past eight weeks I have wrestled with if and what I should share regarding this situation. In the end I decided that if this community (Be Part of the Music/Scott Lang Leadership) was real, than I needed to be real with you. Dealing with all of this has been difficult, but it has also shown me that while there is bad in the world, there is still good in people. We can’t always predict or prepare for the precipitous fall that comes with an unexpected chute. But when sent to the bottom, I do know how to look for, and if necessary, build a ladder! With great appreciation for you! The Grading Curve and the Merits of Sitting Last Chair! Hamilton and the Joy of Mediocrity!